The Global War on Terrorism (GWOT) has resulted in numerous physical and psychological casualties. Mental health specialists have served with honor and contributed greatly to the care of these injured. 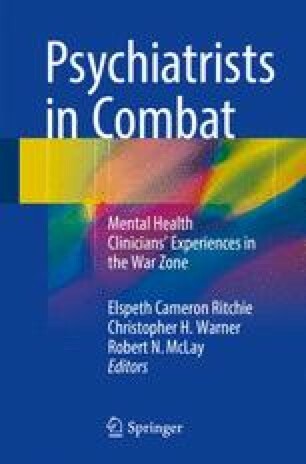 The main focus of this volume is to provide insight into the experiences of mental health providers in combat. However the picture would be incomplete if it omitted the challenges in garrison, in specialized teaching military hospitals in the USA, caring for the physically or emotionally wounded. Disclaimer: The views expressed are those of the author(s) and do not reflect the official policy of the Department of the Army, the Department of Defense, or the US Government. American Psychiatric Association. History of the DSM. Arlington, VA: American Psychiatric Association; 2015. http://psychiatry.org/psychiatrists/practice/dsm/history. Accessed 24 Aug 2015.